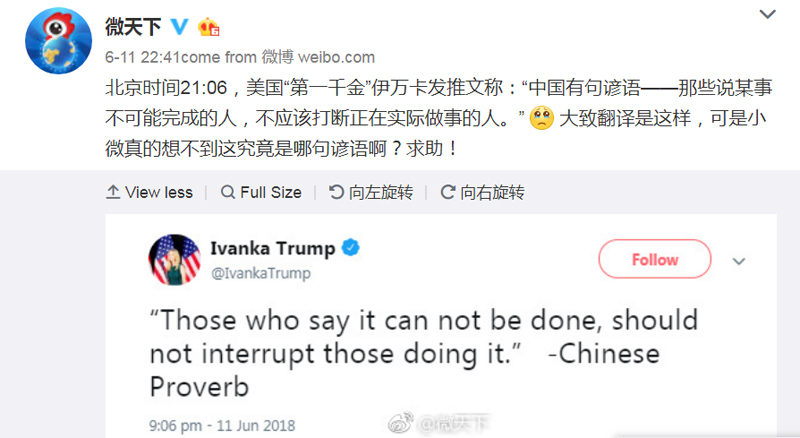 Chinese social media users are scratching their heads over a "Chinese proverb" US President Donald Trump's daughter and advisor Ivanka posted to Twitter as her father prepared for his summit with North Korea's Kim Jong Un. "Our editor really can't think of exactly which proverb this is. Please help!" the news channel for Sina -- the company behind Weibo, China's largest Twitter-like platform -- wrote on its official social media account. Some suggested the proverb "the foolish old man removed mountains" -- a common phrase used to signify perseverance. It refers to a fable about a man who persisted in his attempt to level a mountain he found inconvenient by dogged digging. But her mysterious proverb was panned on Weibo. "She saw it in a fortune cookie at Panda Express," one user wrote. "But why are Trump WH (White House) aides giving our proverbs to China, increasing our proverb deficit?" he quipped.